Use this flow chart to explain how to add, subtract, multiply or divide with mixed numbers and fractions. Can the fractions be simplified? Does the sum contain mixed numbers? Are you adding/subtracting or multiplying/dividing the mixed numbers? Are you adding/subtracting or multiplying/dividing the fractions? Add or subtract the whole numbers first. Convert the remaining fractions to a common denominator. Convert the fractions to a common denominator. Leave the denominator as it is! Are you multiplying or dividing the fractions? Flip the second fraction over. 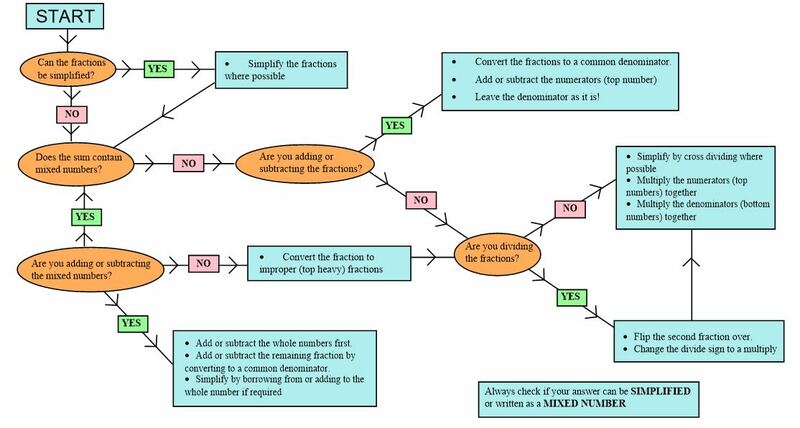 Click the image below for an enlarged version of the fraction flowchart.